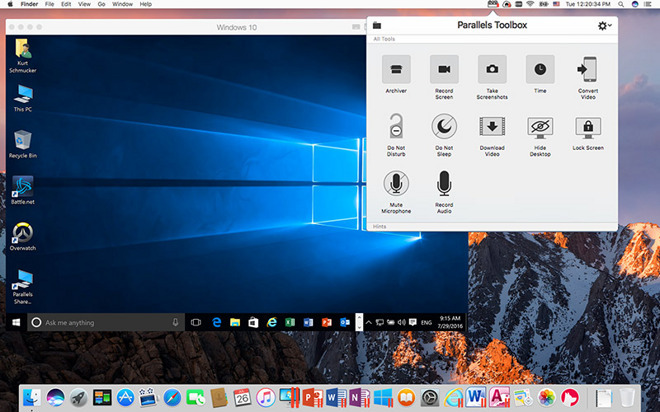 Parallels Toolbox is touted as a highlight of this year's Parallels Desktop 12 for Mac version, offering users 20 tools to streamline commonly executed tasks. The toolbox resides in the menu bar as a drop down option, with one-click access to handy tools grouped into four sections: take screenshots, record screen, time and archiver. Alongside everyday tasks like capturing screenshots, Toolbox tools can initiate area, window and screen recording, download and convert videos, manage stopwatches, alarms, timers and date countdown utilities and archive files. Additional tools include record audio, mute microphone and hide desktop, the latter being useful for screen recording and presentations. For those just getting started with Microsoft Windows, Parallels 12 adds the ability to purchase and install the operating system directly from the Parallels Desktop Wizard. In addition, a Scheduled Windows Maintenance option enables update downloads at times convenient to the user. Developers also worked with gaming studio Blizzard Entertainment to optimize Parallels 12 for Mac to support Overwatch, popular multiplayer FPS available on PC and Xbox. Parallels' gaming chops also extend to the Windows 10 Xbox app, meaning users can stream Xbox games on Mac. Other new features include the ability to control storage space used by virtual machines from the Optimized Storage in macOS Sierra, port Microsoft Edge and Internet Explorer passwords in Mac's Keychain, manually cancel VM actions and assign special behaviors to Windows apps. Parallels Desktop 12 also improved support for resizing Windows VMs on Macs equipped with Retina displays. As for backend improvements, Parallels Desktop 12 offers up to 90 percent faster Snapshot creation, 60 percent faster suspend of VMs and 23 percent faster Shared Folders performance. Finally, users can expect an up to 10 percent battery life improvement from previous iterations. 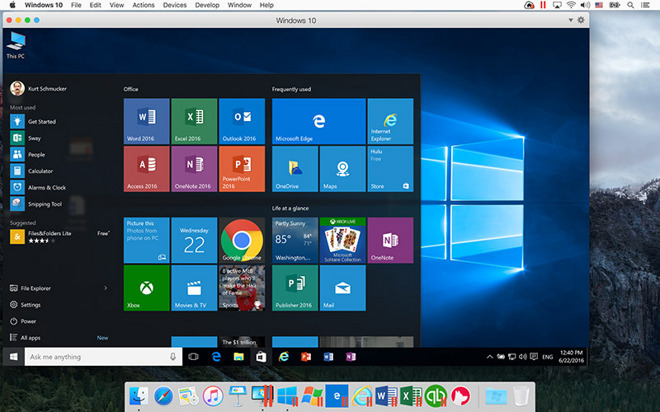 Existing users running Parallels Desktop 10 and 11 can upgrade to Parallels Desktop 12 for Mac, Parallels Desktop for Mac Pro Edition and Parallels Desktop for Mac Business Edition can upgrade today. Upgrade pricing comes in at $49.99 or $49.99 per year for the Pro Edition. New customer pricing for Parallels Desktop 12 for Mac is $79.99, while the Pro Edition and Business Edition both cost $99.99 per year. Availability begins on Aug. 23. Finally, Parallels Toolbox for Mac, which comes with all versions of Parallels Desktop 12, will also be available as a standalone product for $9.99 per year. A 14-day trial can be downloaded from the Parallels website starting Aug. 23.